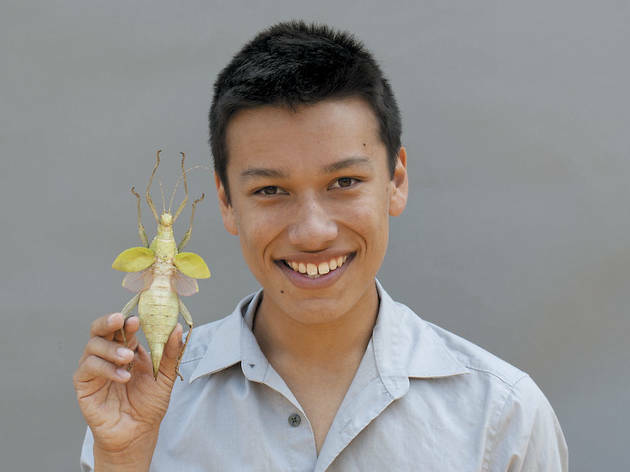 University of Chicago undergrad Matthew Krisiloff is working on making patties from crickets, flies and more. A few weeks ago, University of Chicago undergrad Matthew Krisiloff climbed into his car and started the three-hour drive from Los Angeles to Pismo Beach. He was on a trip to visit two powerhouses of the insect-eating world: HOTLIX, the leading maker of insect candies and novelty foods, and Daniella Martin, a blogger who has built something of a career out of recipes for Bee-LTs (sandwiches with bee larvae) and instructional videos on how to fry scorpions. Krisiloff has tried a few of HOTLIX’s products (sour cream and onion Crick-Ettes, watermelon worm suckers) and says “they’re interesting.” Candy has never much grabbed his fancy; he doesn’t like the taste of chocolate. He’s hoping the meeting will help take insects to the next level—away from novelty products and into the everyday American diet. That goal is the mission behind Entom Foods, Krisiloff’s year-old company based in Hyde Park, where the 19-year-old is entering his second year as a Law, Letters and Society major at U. of C. Inspired in part by an international studies class, Krisiloff started the company with four classmates to enter the CCI Innovation and Entrepreneurship Competition, a contest for business ideas with both a technological element and a social motive. Getting the concept of eating insects into the mainstream is “a pretty out-there idea,” Krisiloff admits. “I wasn’t convinced of it at all myself.” Nevertheless, he was able to convince the competition judges (a batch of sugar cookies fortified with crunchy grasshopper pieces may have helped). At the end of the competition, Entom Foods was deemed the winner and awarded $10,000. But wait—what’s the social motive behind eating bugs? The answer is actually the most innovative part of Entom. In a counterintuitive move, the company is aiming insects at the Western world in hopes of influencing eating habits in the Third World, while at the same time making Western food habits less wasteful. Insect meat is high in protein, low in fat and cholesterol and, most important, cheap and plentiful. The biggest challenge in starting with the West is, of course, nixing the insect stigma. Krisiloff knows this. Over the summer, he used some of his prize money to further study insect proteins at a university in the Netherlands. There, he focused on crickets, grasshoppers and mealworms for human consumption, and black soldier flies for animal consumption. The researchers in the Netherlands and Entom are each likely years away from releasing any kind of food product, but they agree on one thing: Whatever they make, you probably will not recognize it as insect meat. Suffice to say, an Entom Foods bug burger would not contain any of that. A process called high-pressure processing (already used in shrimp production) would separate the insect’s meat from the exoskeleton, leaving the “disgusting” bits behind.